It is foolish to make any hard and fast predictions regarding the future but if any one of these people listed in this headcount had predicted that within fifteen years, Port Elizabeth harbour would be busier than Cape Town’s, they would have be immediately certified mad. Just imagine what these people would have experienced. As the Irish Settlers were initially located at Clanwilliam, my great great grandfather, the Rev Francis McCleland, would only become a Port Elizabeth citizen when the village was five years old, thereby technically he was not eligible to be classified as an original citizen ab initio. The list was prepared by a Mr Griffin Hawkins and this list now resides in the South African collection at the Port Elizabeth Municipal Library. Apparently, according to an article by Mrs. Rainier, this document was discovered among Mr Griffin Hawkin’s papers after his death in Humansdorp at the age of 79 in 1883. The reference to Walmer however indicates that this must be a copy of the original list as the name “Walmer” was not adopted until 1853. In 1823, a census of the town indicated that its population consists of 73 men, 30 women, 44 boys and 33 girls. 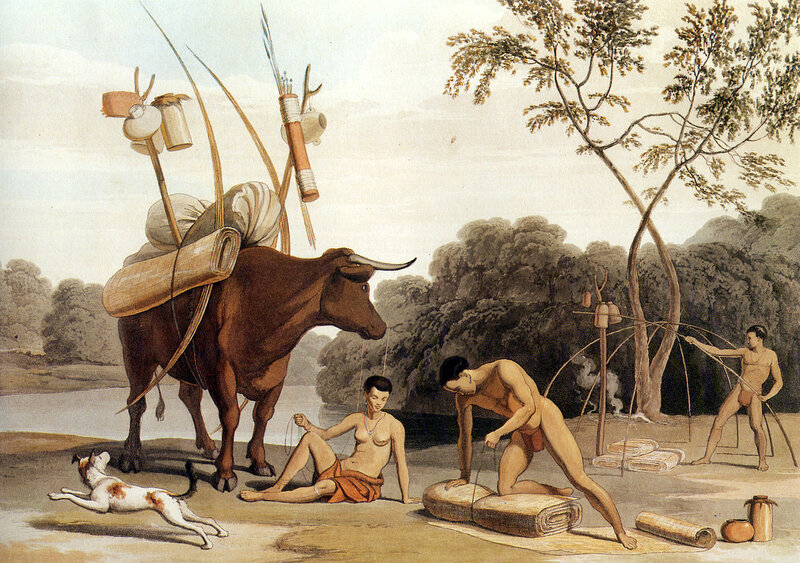 The figures exclude the 75 KhoiKhoi employed by the residents and the 64 slaves they also owned. The biographical sketch of the individuals is the output of Mr A. Porter. Griffin Hawkins: Griffin was born in 1802 or 1804. He came to South Africa to join his uncle, John Hawkins, in Cape Town. He relocated to Port Elizabeth and subsequently went into partnership with John Owen Smith to set up the firm of Hawkins & Smith. The partnership was dissolved and Hawkins joined a firm which was established at the mouth of the Kromme River. IN 1835, he purchased a farm at Elands River and in 1840 started a school in that district. 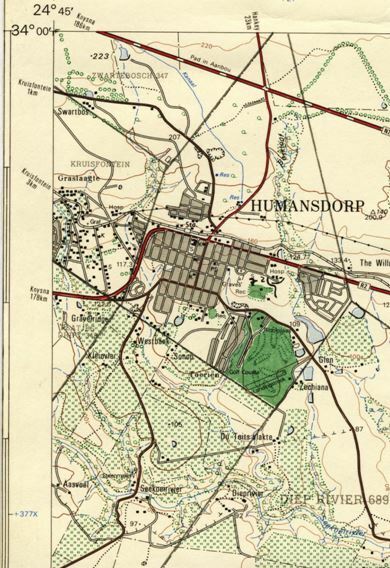 When Humansdorp was founded in 1849, he took up residence there and became the postmaster. Subsequently he became market master, a post that he held to his death in 1883. According to the Commercial Advertiser on 11th August 1841, Griffin Hawkins had married a Miss Martha Niewenhuysen of Cape Town in St. George’s Church on the Monday with the REv. Geo. Hough M.A. officiating. The couple had four sons and two daughters. Francis Evatt was born in Carlow, Ireland in 1770, the son of Captain Henry Evatt of the Monaghan Militia who was killed in the Irish Rebellion of 1798. Francis was commissioned as Lieutenant in the 21st Light Dragoons on 28th February 1805, and arrived with his regiment at Cape Town in 1806. In 1810, he came with his regiment to Algoa Bay and saw service on the frontier. On 2nd September 1811, he was married to Eliasabeth Frederica Petronella Kirsten by the Garrison Chaplain at Cape Town. In 1817, he was appointed Commandant of Fort Frederick. One of his perquisites was the use of Chelsea Farm which was owned by the Cape Government. He, along with Captain Fairfax Moresby, supervised the landing of the 1820 British Settlers. 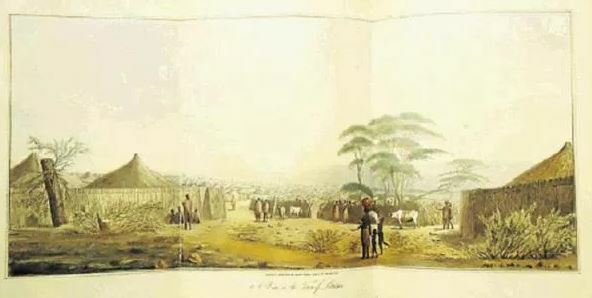 When Sir Rufane Donkin visited Port Elizabeth in 1820, he withdrew Captain Evatt’s privilege of the use of Chelsea Farm but raised the Commandant’s salary in compensation. In 1821, Captain Evatt was granted 250 morgan of ground near the present Wedgewood Club as well as Plots Nos. 1, 14 and 22 in the newly laid out township of Port Elizabeth. He sold plot No. 1 to Piet Retief. In 1824, he was chairman of the committee organised to set up an Anglican church in the town. In 1825, in addition to his duties as Commandant, he was appointed as “Government Resident” with magisterial powers. On 2nd December 1831, he was married for a second time, on this occasion to a widow, Anne Amelia de la Harpe. In 1835, he was granted a plot of land at the corner of Daly Street and Prospect Hill, and there he built a substantial house, overlooking the Bay. He died on the 21st March, 1850, and was buried in the Settlers’ Cemetery on Russell Road, by the Independent Church Minister, Rev Adam Robson. This was in accordance with his express wish. Why he was not buried as an Anglican is not known. He had only one child, as far as is known, a daughter Margaret who died in England in 1852. Mrs Evatt died at Graaff Reinet in 1881 at the age of 87 years. Henry Evatt poses a huge problem. In an article written in 1915, F.W. Cooper, former Librarian of the P.E. Public Library, refers to him as Captain Francis Evatt’s brother whereas Hawkins lists him as his son. The known facts are that he died at the beginning of January 1826 and was buried in St. Mary’s Cemetery on the 3rd January, his age being given as thirty-two. This means that he was born in 1793, when Captain Francis Evatt would have been twenty-three. This is an unusual difference in ages for brothers, though, of course, not impossible. Was Captain Evatt previously married in England? This would imply that he married three times. From an official Army list, we learn that Henry was commissioned Cornet in the same regiment as Captain Evatt (21st Light Dragoons) on 19th December, 1806. 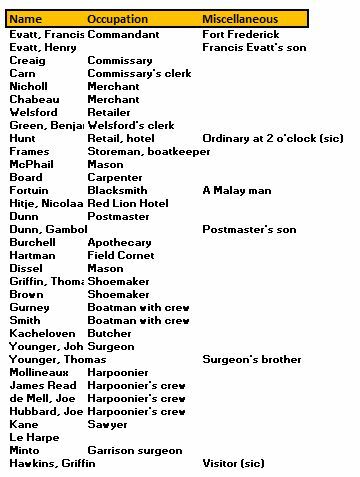 In the burial entry, Henry’s occupation is given as “Clerk to the Government Resident” id est Captain Evatt. Creig. This is probably John Craig, listed as a member of the Commissary General’s staff in 1823. Chabeau. This is undoubtedly John Chabaud who was born in 1796. He was a member of the Wilkinson’s Party which sailed on the “Amphitrite.” He set himself up as a Notary in Port Elizabeth in 1830 and married Dorothy, daughter of Thomas Pullen. Nicholls. He cannot be identified. Even though there was a Nicholls aboard the Settler ship “Garland”, nothing is known of him beyond his surname. Welsford. S. Welsford, shopkeeper, arrived in the Cape in 1822 but no further details are known. Benjamin Green also arrived in the Cape in 1822. He was Welsford’s clerk in 1822 but later moved to Grahamstown. In 1828 he left with Surgeon Alexander Cowie for Natal. He was with Surgeon Cowie at Delagoa Bay in 1820 when Cowie died. Hunt. 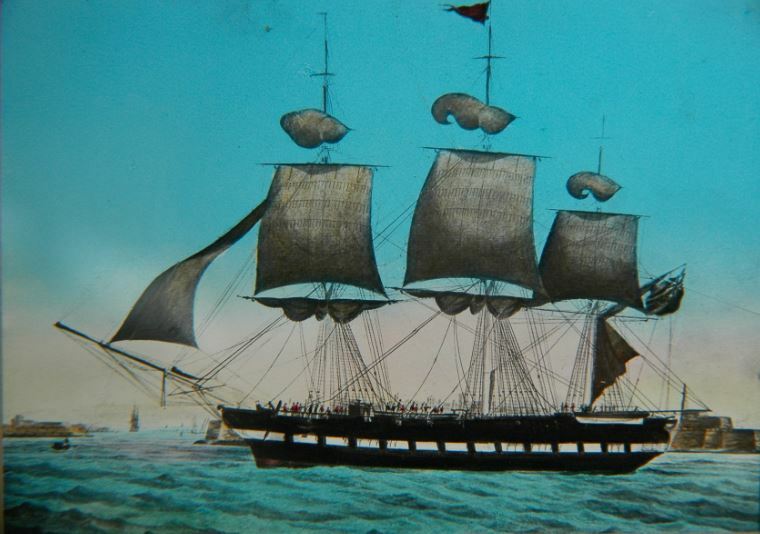 Richard Hunt, born in 1794, was a member of Mandy’s Party, sailing on the “Nautilus” accompanied by his wife and two children. The Cape Town Gazette of 9th February, 1822, records that Richard Hunt had established a store at Port Elizabeth. Frames. William Brookesby Frames arrived in Algoa Bay in 1815 to join the firm of Heugh and Fleming in Uitenhage. 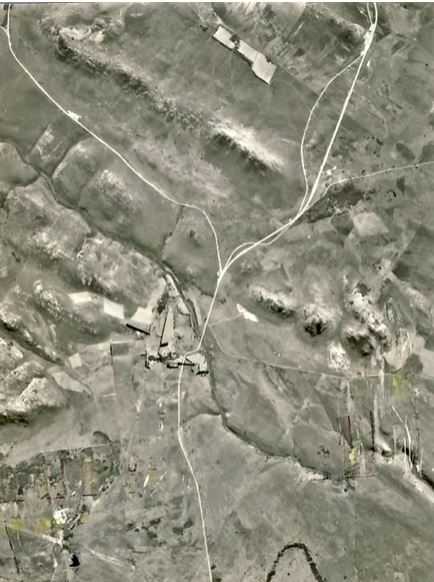 In 1828, he acquired Gomery Farm, the former Strandfontein owned by Piet Retief. He also acquired the farm Nooitgedacht, as he is recorded as having sold it to John Niblett in 1845. In 1851, he set up a woolwashery in the Sharks’ River Valley and in 1864 built “Frames Reservoir” on the Shark’s River, the town’s first piped water supply. In 1863 he purchased back portion of the farm Nooitgedacht and renamed it Theescombe. He married Anna Marie Berry on 17th August 1828.
among other. He was buried in St. Mary’s Cemetery on 2nd March, 1830, his age being given as 35 years, 8 months and 7 days. Hence he was born in June, 1794. Board. Born at Dalwood, Dorset, England in 1797, Jonathan Board was a member of Daniell’s Party on board the “Duke of Marlborough”. In 1829 he purchased Rufane Vale, part of Captain Moresby’s estate, in the Baaken’s Valley. He died on 25th April 1853 at the age of 56 in Port Elizabeth. He married Eliza Lovemore (daughter of Henry & Sarah nee Jones) born 23rd July 1804 in 1827 and they had six sons. She died on 4th February 1856. The only other improvement to port facilities during this period [1820s] was the provision of water to ships by a Malay, Fortuin Weys. He erected a pump and laid pipes from it to the landing beach. 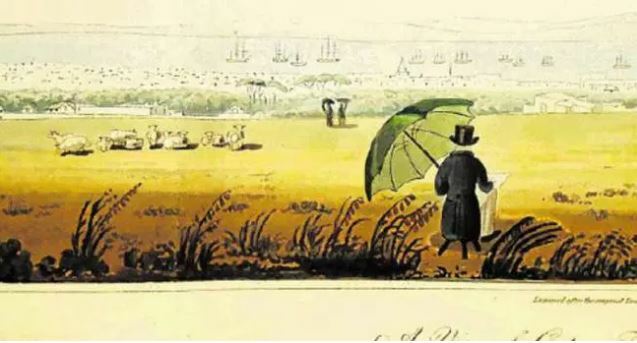 Weys by 1834 was described by Thomas Pringle as “one of the wealthiest and most respectable inhabitants of the place”. 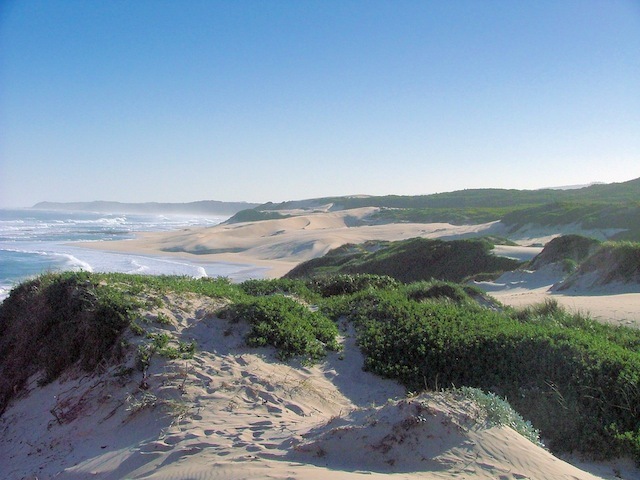 He had originally been granted land at Algoa Bay in March 1820. 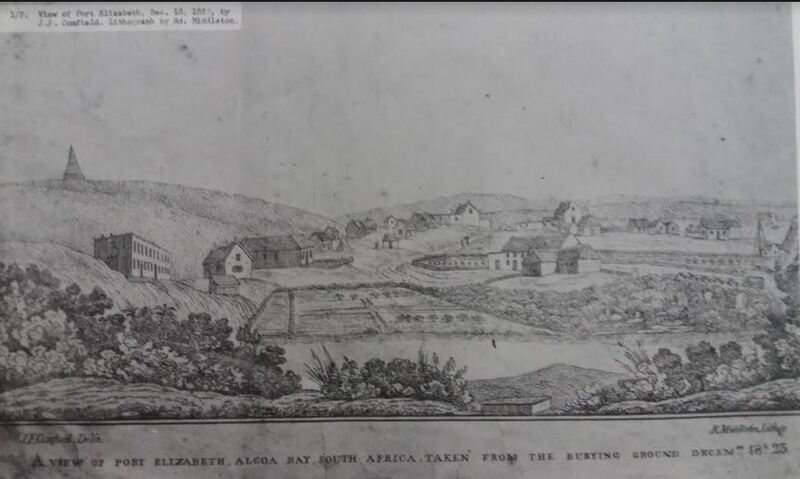 By the time the settlers landed his house, still under construction, was the second substantial one to be built at what was soon to become Port Elizabeth. He was listed as a blacksmith by Griffin Hawkins in 1822. In time he acquired a number of properties in the town and further afield. In January 1839 the executors of the Weys estate put up for sale: 29 building lots, 3 other properties, a 6,5 hectare smallholding on the Baakens and a 1013 hectare farm, Doorn Nek, near the Zuurberg – GTJ 3/1/1839 p 1. 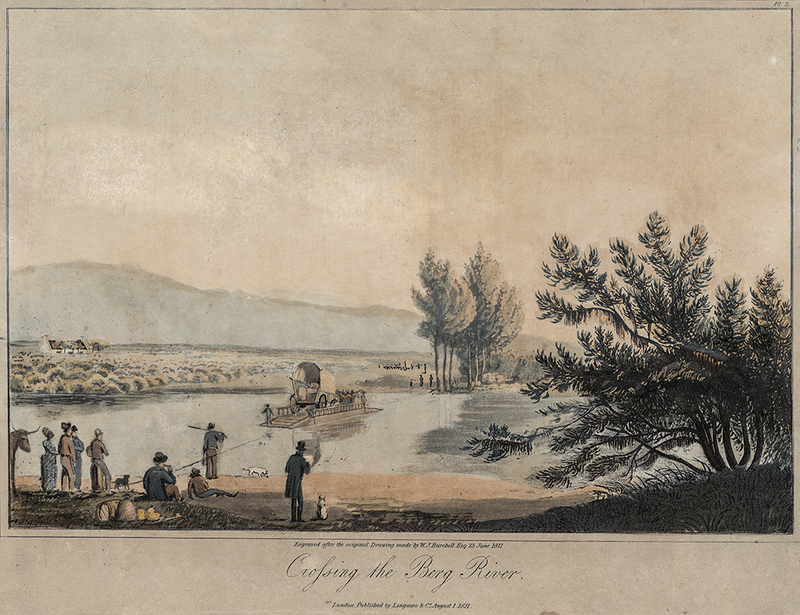 The Baakens property was known as Fortuins Valley – GTJ 26/3/1840 p 1. As late as 1890 his executors became involved in a legal wrangle over land reclaimed along the Victoria Quay, adjacent to Weys land – PEPL Weys file. 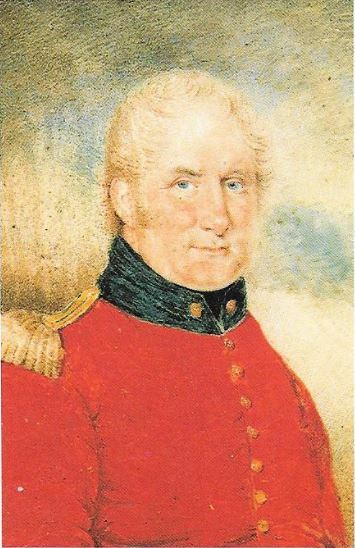 Captain Moresby, of the Navy, was the proprietor of the house then founded with much ceremony, and of which our party assisted to dig the foundation. The only other house then commenced, excepting the temporary offices and cabins already mentioned, was one erecting (sic) by a Malay named Fortuin, now, I understand, one of the wealthiest and most respectable inhabitants of the place. As a blacksmith, Fortuin was one of the earliest industrialists in Port Elizabeth. In the 1820s he also improved the provision of water to ships by installing a pump and pipeline which carried water to the beach. Hitge. Nicolaus Hitge was born in 1785 and arrived at the Cape from Alt-Leining, Germany in 1808. On 14th May 1820, he married Mary Hunt at Uitenhage. Soon after the arrival of the 1820 settlers, he erected the Red Lion Tavern on Damant Street, Port Elizabeth. He died in Uitenhage in 1848. He had five children. Dunn. William Dunn, born in 1774, arrived at the Cape in 1821. He was appointed Post Master at Port Elizabeth in 1822. In 1826 he acquired a second job as Collector of Customs whilst retaining his job as Postmaster, being dismissed from this post in 1828. Before emigrating to the Cape, he married Sarah Francis Pearson. They had four sons and three daughters. He died on 17th September 1839. Dunn. Gambol Dunn was the son of William Dunn. No further details are known about him. Burchell. James Burchell set up practice as a surgeon in Port Elizabeth in February 1821. He was accompanied by his wife. He was the brother of the famous traveller and botanist, William Burchell. Hartman. 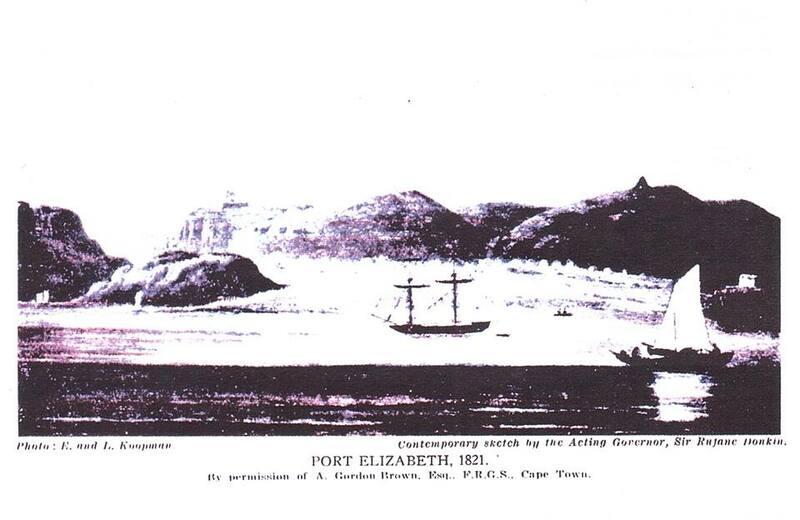 S. Hartman is recorded as Field Cornet in Port Elizabeth in 1822. The Hartman farm was situated near the bottom of the present Russell Road. Dissel. A Johann Dissel (or Diesel) arrived at the Cape from Schwarzburg, Germany in 1797. He died on 31st October 1823. He was twice married. Wife number 1 was Everdina Christina (surname unknown) and wife number two was Martha Magdelena Pretorius. He had four children by his first wife. Griffin. Thomas Griffin was born in 1786. He arrived with Bailie’s Party on the Chapman with his wife Sarah and six children. He was appointed Court Messenger in Port Elizabeth in 1826. Gurney. Charles Gurney, born in 1778, was the leader of the party from Deal Kent which arrived aboard the Weymouth. He established a fishing settlement near the mouth of the Swartkops in the area now known as the Deal Party Estate. Later on he was appointed market master. He died in Port Elizabeth on 12th July 1853. A son, Charles, came with him in 1820. Smith. 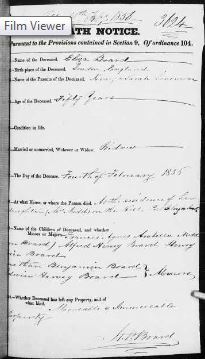 John Smith of 1822 census of Port Elizabeth is John Smith born in Cork, County Cork Ireland who died at the Government’s Boathouse in Port Elizabeth on 24 March 1837 and is buried in the St Mary’s Cemetery together with his wife. John Smith 1787-1837 is the father of William Smith the 1st mayor of Port Elizabeth. Kacheloven. He cannot be identified. Younger. John Younger was born in 1793. John was a surgeon with Scott’s Party on board the Nautilus and was accompanies by two younger brothers, Thomas, aged 16 and Charles aged 14. In 1822 he was betrothed to Catherine Stanley. He became District Surgeon at Somerset East in 1825 and died in Uitenhage in 1850. Mollineaux. He cannot be identified. Read. A shipwright, James Read, came to the Cape in 1813. Further details are not known. De Mell. Joseph Anthonie de Mell came to the Cape from Rio de Janeiro at an unspecified date. He married Martha Carolina H. Muller on 15th October 1821. Hubbard. Joseph Hubbard was born in 1798. He was a member of Gurney’s Party on the Weymouth. He settled at the Deal Party fishery and became a whale harpooner. In 1832, he took over the Addo Drift Inn and later in 1836 he moved out of the Cape altogether by becoming a trader beyond the Orange River in partnership with Samuel Webber. La Harpe. The de la Harpes was an extensive family, and as such, it has not been possible to identify which one to which the entry refers. Captain Francis Evatt married a widow, Mrs. Anna Amelia de la Harpe in 1831. Minto. James Minto was a surgeon to the garrison at Fort Frederick in 1820. In 1830, he was appointed Surgeon to the Cape Mounted Rifles. In 1831, he married Mary, daughter of Thomas Nelson. Pullen. Born in 1775, Thomas Pullen, a farmer, was a member of Owen’s Party on board the Nautilus. He was accompanied by his wife and twelve children. He was buried at St. Mary’s Cemetery on 24th September 1837. Damant. John Sancroft Damant, born in 1785 at Lammas, Norfolk, served with the British Army and was sent to the Cape in 1806. He was appointed Deputy Assistant Commissary-General in 1813, and later Paymaster to the Garrison at Fort Frederick. He married Maria Johanna Charlotta, daughter of Frederick Korsten, in 1817 and resigned his commission in order to farm at “Lammas” at Hankey on a property of his father-in-law. He went to England and returned with his brother Edward and the 1820 Settlers. He died at Cradock Place in 1825, leaving two surviving children, Sophia and Frederick. His widow married John Centlivres Chase in 1831. Scheuble. Jan Mattheus Scheuble was born on 20th June, 1802 and was married to Carolina Elisabeth Metelerkamp. One of John Centlivres Chase’s sons bore the name Scheuble. Korsten. Frederick Korsten was born at Zierikzee, Holland, on 17th August 1772. He became a naval cadet in 1795 and was captured by the British when a Dutch fleet surrendered in Saldanha Bay on 17th August, 1796. He became a clerk in government service. He married Johanna Cornelia Hoets on 25th January 1799 and had one daughter, Maria Johanna Charlotta, born in 1800. In 1805 he left government service to go into commerce. He arrived at Algoa Bay in 1810 and built up a large and varied commercial organisation. He purchased the farm Papenkuilsfontein in 1812, renamed it Cradock’s Town, later Cradock Place, and built a fine homestead where most of the notables who visited Port Elizabeth were entertained. He died at Cradock Place on 16th June 1839 and was buried in the family mausoleum. His widow died on 11th December 1865. Kitchingman. James Kitchingman was born in Rotherham, Yorkshire on 21st June 1792. He was ordained a minister of the Independent (Congregational) Church in 1816and came to the Cape as a London Missionary Society missionary in January 1817. He served first in Namaqualand and was appointed to Bethelsdorp in 1821. He returned to Cape Town and served at Paarl from 1826 to 1831 after which he returned to Bethelsdorp. He died there in 1848. He married Sarah Gill in 1816 and had three sons and two daughters. Munroe. John Munroe was a teacher in Bethelsdorp from 1821 to 1827 when he moved to Grahamstown as a missionary. He died at Cradock Place on 6th April 1848. Kemp. Ebenezer Kemp, born in London in 1793, was one of three brothers who emigrated to the Cape. He arrived in November 1816, and set up business with his brother George. In 1821, the brothers relocated to Port Elizabeth and established stores at both Cradock Place and Bethelsdorp, as well as in Port Elizabeth itself. Ebenezer died in Bristol, England in 1859. Arnot. David Arnot, born in 1795, came out with Moodie’s Party in 1817. In 1822 he moved to Bethelsdorp as a blacksmith, doubtless assisting to produce wagons for the transport trade on which Bethelsdorp largely depended. In 1851, he was a trader in Bloemfontein but died at Colesburg in 1859 at the age of 64. Thornhill. Christopher Thornhill, born in 1773, was the leader of a party of British settlers arriving on the Zoroaster. He was accompanied by his wife and four children. He farmed at “Thornhill” Bathurst and also had extensive business interests. Barker. Rev. George Barker, born in 1789, arrived at Cape Town as a London Missionary Society Missionary in 1815. He first went to Bethelsdorp but was soon transferred to Theopolis. He returned to Bethelsdorp in 1819 but returned to Theopolis in 1822 where he served until 1839, when he was transferred to Paarl. He retired in 1856 and died in Paarl on 9th May 1861. His first wife was Sarah Williams, who he married in 1814 and Hilletje Smuts was his subsequent wife who he married in 1844. He had six surviving daughters and three sons from his first marriage. Shepstone. Rev. John William Shepstone, born in 1796, a Wesleyan missionary, arrived with Holder’s Party on board the Kennersley Castle. He assisted with the construction of Theopolis and later established several Wesleyan missionary stations. 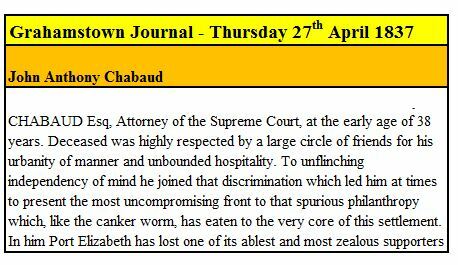 He died at Kamastone near Queenstown on 26th May 1873. His first wife was Elizabeth Brooks and his second wife was Ann Smith, both of whom bore him six children. He was the father of Sir Theophilus Shepstone. Maskell. John Maskell arrived at the Cape in 1822 and established a store for H. Rutherford & Co of Cape Town at Theopolis. Maskell lived there from 1822 to 1832 and in 1834, he opened a shop in Port Elizabeth. De Vine. James De Vine, born in 1784, arrived with Butler’s Party on board the Fanny with his wife and two children. Muller. Cornelis Muller cannot be identified with certainty. The farm Welbedacht, later Walmer, was granted to Anthony Michael Muller in 1815. He had a cousin, Cornelis, to whom he must have leased the farm. Muller. He was probably Johan Joseph Muller, born in 1778, a son of Carl Muller who came to the Cape from Hanover in 1760. JJ Muller was Field Commandant of the District of Uitenhage in 1822. Lovemore. Born in 1777, Henry Lovemore arrived in Algoa Bay on the Sir George Osborn. He was nominally a member of Bailie’s Party but never joined them He was accompanied by a daughter of his first marriage and two sons and two daughters of his second. He acquired the estate, Bushy Park, and built a fine residence there which became the centre of social life. He was buried at St. Mary’s Cemetery on 23rd November 1851, his age been given as 74 years. Niekerk. Chelsea Farm was acquired by G.L. van Niekerk. There are two possibilities. 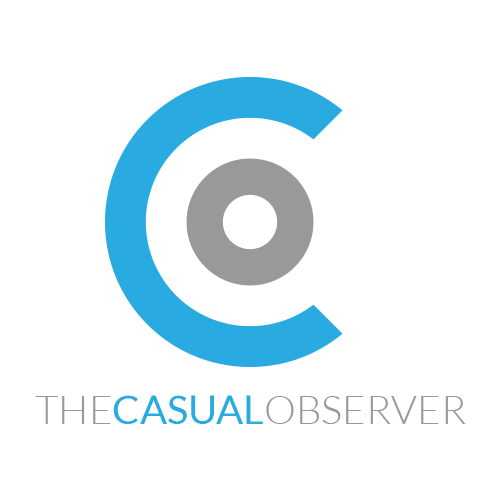 The list could either be referring to Gerhard Lourens, senior, or Gerhardus Lourens junior. The former died on 20th January 1822, probably before Hawkins had complied the list. However, the son was only 19 years of age at the time of his father’s death. Bota. This is probably a descendant of Theunis Botha who was granted the farm Buffelsfontein in 1776. Niekerk, Pieter. This reference is possibly to Pieter Cornelius van Niekerk, Field Cornet for the Coega area in 1822. If so, he was born on the 8th October, 1797 and died on 15th October 1859 in the Uitenhage area. Ferreira. Born in 1777, Thomas Ignatius Ferreira, son of Thomas Ignatius Ferreira of Papenkuilsfontein which was granted to him in 1776. Ferreira. Born in 1781, Salomon Ferreira, son of Thomas Ignatius Ferreira of Papenkuilsfontein. He married Cornelia Aletta Potgieter in 1798. Uys. Jacobus Johannes Uys, born on 26th June 1770, a future Voortrekker leader, was farming in the Gamtoos area in 1822. He left with his party of trekkers in April 1837 and died near Pietermaritzburg in July 1838. Potgieter. Born Theunis Potgieter in February 1782, members of the Potgieter family owned three farms on the Kromme River. Oldham. Thomas Oldham was born in 1793. He was a member of the Baillie Party which arrived on the Chapman. In September 1821, he was given permission to leave the location allocated to him and he moved to Grahamstown. Later he opened a shop at “the Creek,” the mouth of the Papenkuils River. Meeding. Hendrik Pieter Meeding was born in 1786 and died on 5th February 1858. His farm, Jagers Bosch, was located on the Kromme River near the eastern end of the Langkloof. Wagner. 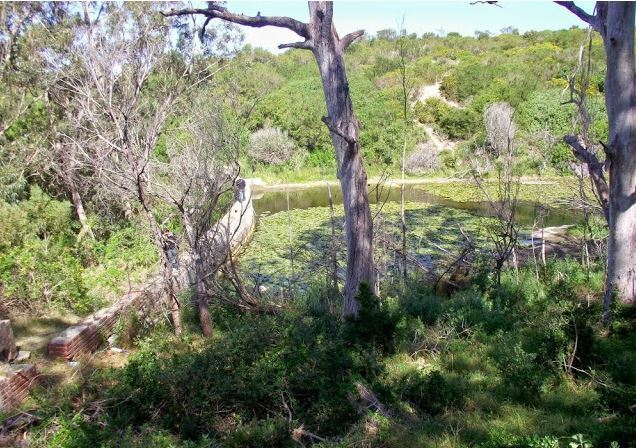 A farm, Rondebosch, was located north of the Kromme River mouth. Professor Charles Wait of NMMU has kindly supplied me the family records relating to this person. All errors in translation are mine. 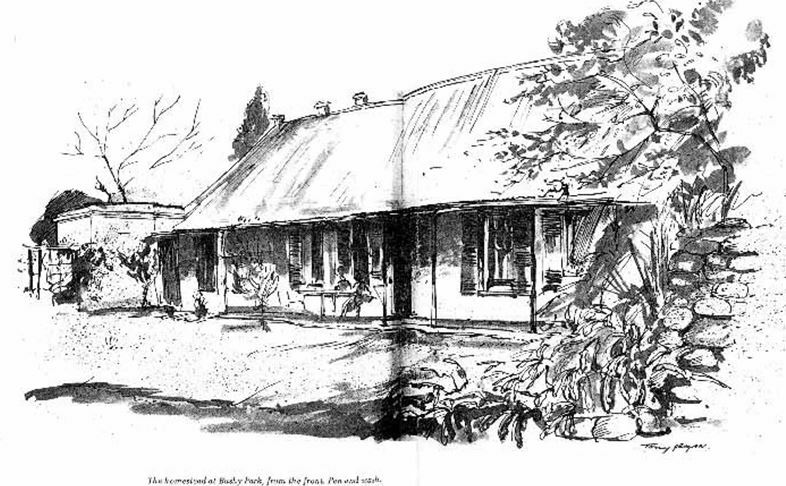 History of Rondebosch: The farm Rondebosch, formerly known as Zwarte Bosch, is located about 7km north of Humansdorp. On 19th January 1819, it was proclaimed a perpetual quitrent farm, which replaced the old loan farms system, under a 1813 law of the Governor, Sir John Cradock. The first owner of the farm was a bachelor, John Henricus Scheepers. During 1819, Christiaan Friedrich Wagner was sent to the eastern border as part of the great military force that Lord Charles Somerset sent to the eastern border in order to defeat Slambie and the prophet Makana during the 5th Frontier War. At the end of 1819, his service period expired. 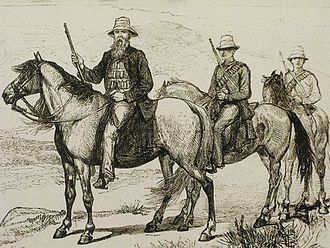 The British government offered to relocate the soldiers to anywhere in the world, but Wagner and his friend, George Hippert (born during 1790 in Ruppin, Brandenburg, Germany), decided to remain in South Africa and started walking from the eastern border to Cape Town. When they traversed over the ridges beyond the Kabeljouws River, as the main road then meandered, they spotted the farm Zwarte Bosch with its many trees, lying in a bowl half surrounded by mountains, they decided to stay there with Scheepers. Scheepers bred Afrikaner cattle and lived in a three-room “hartbeeshuisie”. The kitchen was on the west side; as evidenced by the charcoal which was accumulated there, the living room in the middle and the bedroom on the east side. Wagner and Hippert decided to stay there and started a tannery and “tuiemakery”. A hundred years later, the holes where the black sheets were tanned in one hole and the red ones in another, can still be seen on the lower old site near the river. They also made saddles, harnesses and bridles and sold to “togryers” who often stayed over on their way between the Cape and the Eastern border. 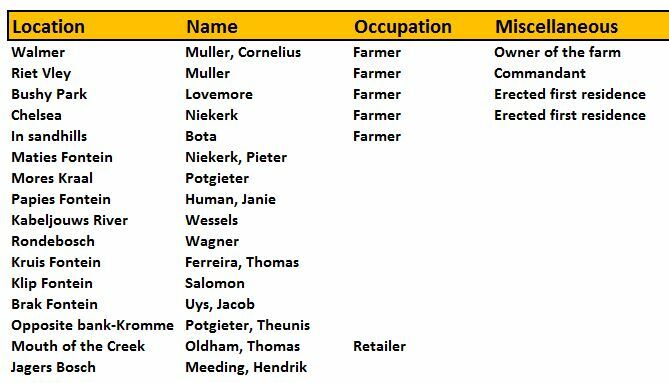 They did so well financially that Hippert, who already had citizenship, purchased the 3,000 acre quitrent farm Zwarte Bosch, number 347, on 11th April 1823, from Scheepers for 9,000 guilders. The farm is located in the former district of Uitenhage. According to legend, Wagner and Hippert purchased the farm together and later Wagner bought Hippert out, but according to the various purchase contracts, this is not true. Actually Scheepers continued residing on the farm and also died there, and at his request, he was buried high on a hill “so that he could forever see his Afrikaner cattle in the meadow beyond the river”! Apparently, it was quite an “affair” to dig the grave in the stony “koppies” and also to transport his body there. Hartbeeshuisie: This is a very primitive house usually built from clay and wood with some type of thatched roof. It would not have had any flooring except that cow dung was thinned in water and spread over the floor. Once dry it formed a reasonable cover for a week or two until it was redone. The closest descriptive name a shepherd’s hut/house. 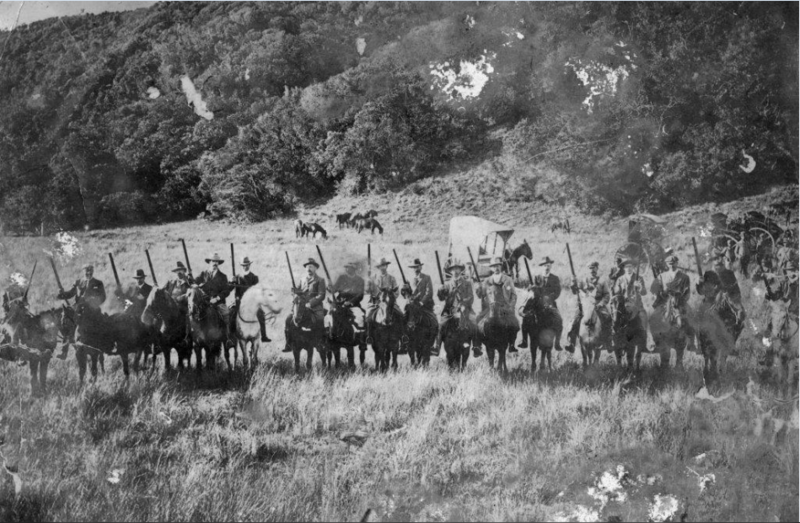 Togryers: These were the ox-wagons which carried loads from Cape Town to the Eastern border. Perhaps one could translate “togryers” as transport wagons. 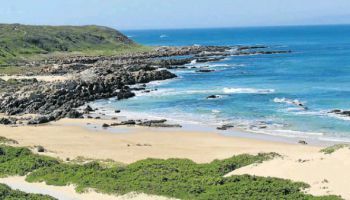 The reason why these wagons deviated from the coastal route at about the present Humansdorp and went the via the present Hankey is because of the difficulty of crossing the Gamtoos River mouth. 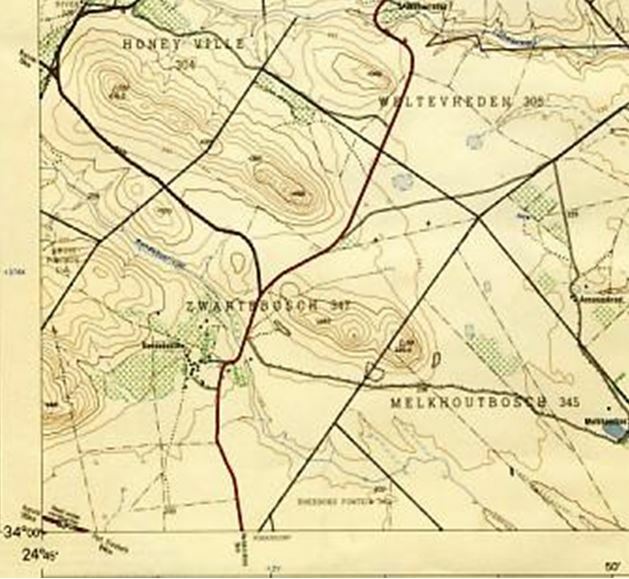 The route was from the present Humansdorp via Rondebosch and Hankey, up along the Klein River, then the present Loerie to the present Thornhill, first named Galgenbosch, later Modderkantien ( “Mud Bar”), then crossing the van Stadens river some kilometres downstream from to-day’s bridge and then pass to-day’s Woodridge College. 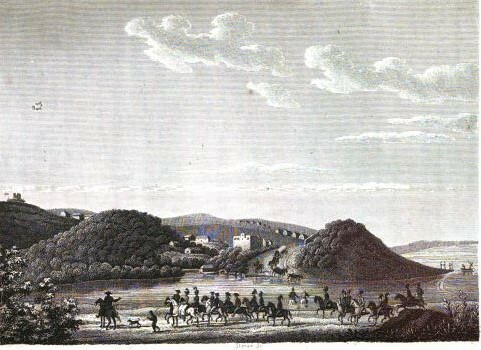 If one stands at the Sarah Baartman grave on the hill outside Hankey and look in the direction of Humansdorp, one can see the vast plane of mainly farming land below along the Gamtoos River. There was a 400 morgen area known as Gamtoos River Wagon Drift. It was used as an outspan for those ox-wagons. History of the Wagner clan: On 2nd July 1827, the almost 41-year-old Christiaan Friedrich WAGNER was betrothed to the 19-year-old SAINTE Catharina Vermaak who was born 8th April 1808. She was the daughter of Jacobus Stephanus Vermaak and Agatha Catharina Potgieter of Tsitsikamma. The furniture was home-made beds, cabinets, tables and chairs with mats of riempies. Father and sons mostly shirts of coarse material, long wide “bush trousers” and short jackets worn with veldskoens and wide-brimmed hats while the mother and daughters wore long “sisrokke” and kappies and all the clothes were homemade. Their 1834 Dutch Bible which is in German script, is still in the possession of the family. On 16 March 1839, Wagner received his citizenship from Sir George Napier (KAB 290,071,542 CO 4003 Ref. 143) and three days later he purchased the farm of Hippert. To the southwest, the farm is bordered by ± 2000 morgen of irrigated meadows owned by Thomas Ignatius Ferreira (a brother of Hippert’s wife). To the northwest it is bordered by the Zeekoerivier mountains, in the north by 3,000 morgen of mountainous pastures of Deep River owned by Gerrit Thomas Vermaak (an uncle of Agatha) and northeast by land for which Daniel Marais has applied and south-east by 4,000 morgan that even now is still government land. Christiaan and Agatha had eight children – two sons and six daughters. She died on 27th May 1866 while Christiaan went to stay with grandpa Freek and granny Nelie ironically in the same house that he built forty years before right until his death on 13th September 1867. Both of them are buried in the cemetery on Rondebosch. After Christiaan’s death, letters were still received from Germany but none of the children could read them. 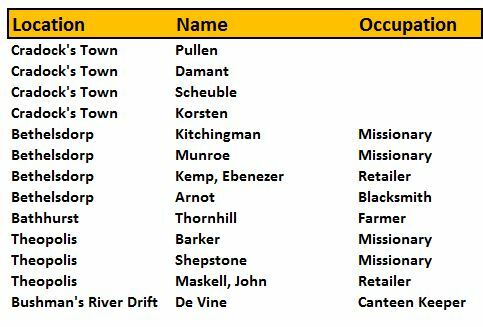 Griffin Hawkins’ List of Inhabitants of Port Elizabeth in 1822 by A. Porter (March 1978, Looking Back, Vol 18 No1). John Smith born 1778 in Devon England married to Rebecca Hancorn settled in Grahamstown area, they were the 1820 Settlers in Willson’s Party. He died at Assegai Bosch. John Smith of 1822 census of Port Elizabeth is John Smith born in Cork, County Cork Ireland who died at the Government’s Boathouse in Port Elizabeth on 24 March 1837 and is buried in the St Mary’s Cemetery together with his wife. John Smith 1787-1837 is the father of William Smith the 1st mayor of Port Elizabeth. They are not related to the Smiths of Devon.